Stick it Down: October guest designer... Asa! Please welcome our card guest designer, Asa. 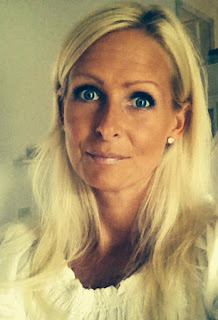 My name is Åsa Johansson and I´m so proud being a GD here this month. I just LOVE this card sketch!!! I´m living in Sweden with my three children, my partner and a dog. I work as a teacher since 18 years. I mostly do cards and layouts. My style is CAS. I love CAS. I don´t think that is a simple style. I love to meet friends and scrap togehter at crops. It´s so lovely to be inspired by others and feel that good feeling that you maybe can inspire some others. I cross my fingers and hope that you get some inspiration from my card. Congrats and what a very pretty and bright card.